Help : The Payment Terms Window defines the different payment terms that you offer your customers and that are offered to you by your vendors. Each invoice must contain a Payment Term. On the standard invoice, the Name and the Document Note of the Payment Term is printed. Help : The Payment Term Tab defines the different payments terms that you offer to your Business Partners when paying invoices and also those terms which your Vendors offer you for payment of your invoices. 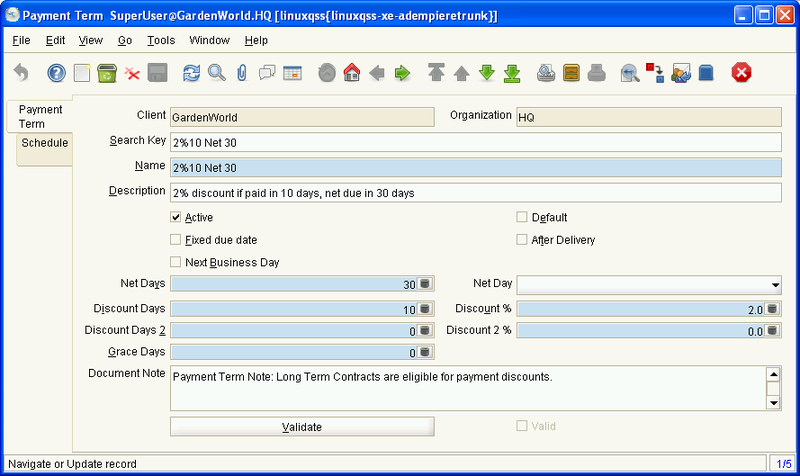 On the standard invoice, the Name and the Document Note of the Payment Term is printed. Here you define the different payment terms that will apply to a business partner. When selected the following fields appear, Fix month day, Fix month cutoff, & Fix month offset. While Net Days, & Net Day are removed. This field only appears if Fixed due date is ticked. A value between 1 and 31. This field only appears if Fixed due date is not ticked. Not available in version 3.4.0s. The tab allows you to set up a schedule for the defined payment term. That is, a schedule whereby the Business Partner, client, or organisation is able to make payments over a period of time. For example, pay 50% today and the remainder in 60 days. If you elect to create a schedule you must create at least 2 records. Otherwise, the Payment Term will not validate successfully. Even if the first record is 100%, the second record must be created but with 0% in the percentage field.. This is the payment term that was selected in the Payment Term tab. The field is greyed out and will be ticked when the record has been successfully validated on the Payment Term tab. When the record/s are saved it will validate automatically. Therefore, if it is still not ticked, then there is a problem. You can then go to the Payment Term tab and click on the validate button to get further information. This page was last modified on 8 May 2008, at 23:33.